Joshua Reynolds (1723–1792), The Infant Hercules (c 1785-89), oil on millboard, 25.5 x 21 cm, Princeton University Art Museum, Princeton, NJ. Wikimedia Commons. Having just told us of the series of events leading to the death and apotheosis of Hercules, Ovid continues book 9 of his Metamorphoses by telling the story of the hero’s birth. Ovid leads into this story by telling us that Alcmena, Hercules’ mother, had found Iole, Hercules’ lover, a good confidante. Since Hercules’ apotheosis, and at the hero’s instruction, Hyllus had married Iole, and she was now pregnant with his child. This reminds Alcmena of her own pregnancy with Hercules, which had been cursed by Juno to be a difficult one. She was in labour for seven days and nights, in agony, and called on Lucina and the multiple Roman deities of childbirth to deliver her child. But Lucina had received instructions from Juno, and would not let the labour progress. leaped up, unclenched her hands, as one amazed. more labor was delivered of my child. her offspring are brought forth through the same mouth. With Galanthis transformed into a weasel, Hercules entered the world. As far as I can tell, only a couple of significant paintings were ever made of this story, and they have long since vanished without trace. A number of engravings have been made for illustrated editions of Metamorphoses, and I have selected two for their narrative content. 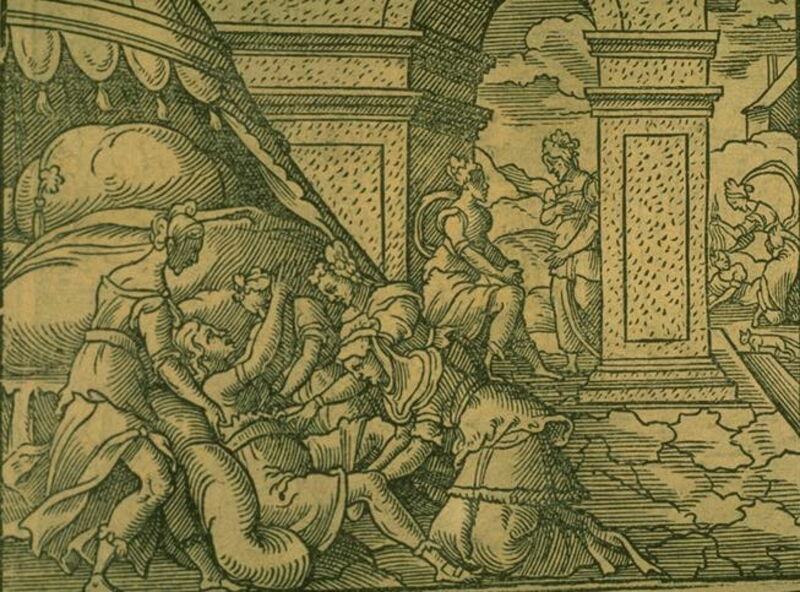 Virgil Solis (1514-1562), Alcmena’s Labour (date not known), engraving for Ovid’s Metamorphoses Book IX, 285-323. Francfurt, 1581, fol. 118 v., image 5. Wikimedia Commons. Virgil Solis engraved Alcmena’s Labour at some time around 1550. 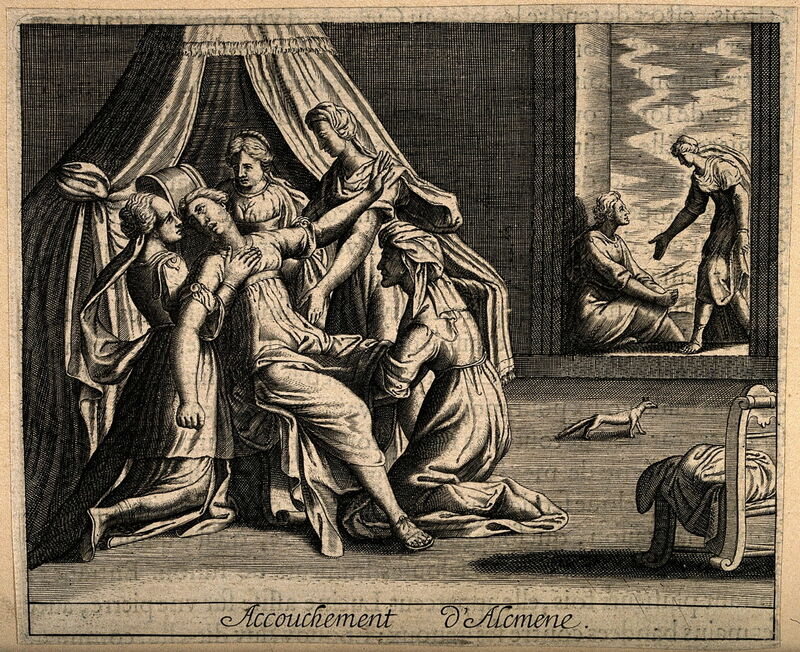 Alcmena is in the left foreground, in the throes of her protracted labour, with four women attending to her. In the background, two women are talking, and at the far right, Lucina is dragging Galanthis to the ground by her hair. There is also what appears to be a small cat, or possibly a weasel, walking past. Subsequent engravings have drawn on this. Some show Lucina and Galanthis fighting in the background, but most omit the cat/weasel. One other comes close to showing the story as told by Ovid. Artist not known, Alcmena Giving Birth to Hercules: Juno, Jealous of the Child, Attempts to Delay the Childbirth (c 1606), line engraving in Nicolas Renouard, Les Métamorphoses d’Ovide, traduites en prose françoise, 11.5 x 14.1 cm, 1606, Wellcome Library (no. 16885i), London. Courtesy of The Wellcome Library, via Wikimedia Commons. 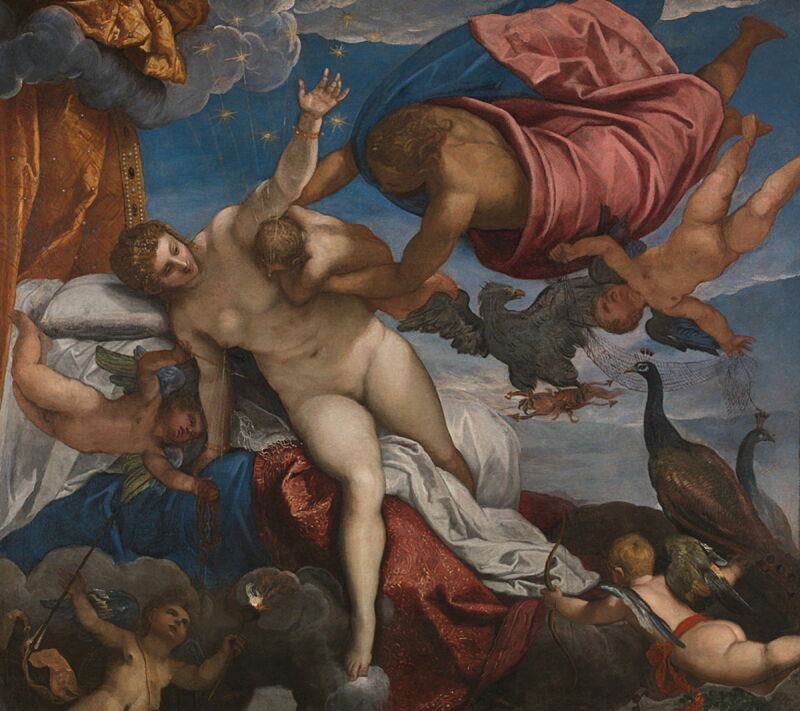 The unknown engraver who made Alcmena Giving Birth to Hercules: Juno, Jealous of the Child, Attempts to Delay the Childbirth, in about 1606, has an almost identical group around Alcmena. The same two women are talking in the background, but the ‘cat’ has clearly become a weasel and is here prominent. Other stories about Hercules as a baby and young child, which Ovid doesn’t tell here, have been much better represented in paintings. 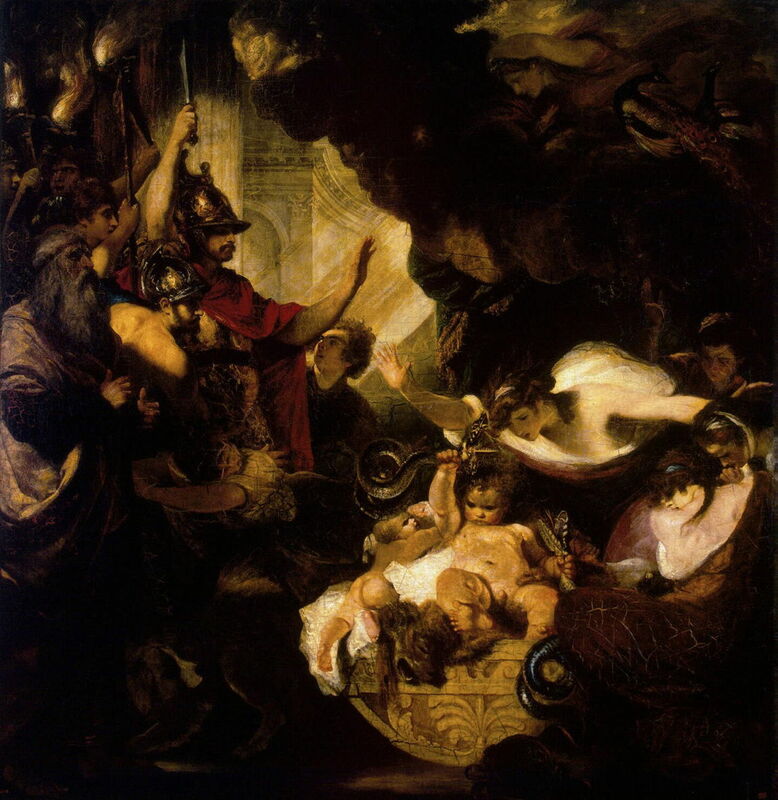 According to older Greek myths, the sons of Jupiter could only become divine if they were suckled at Juno’s breast. 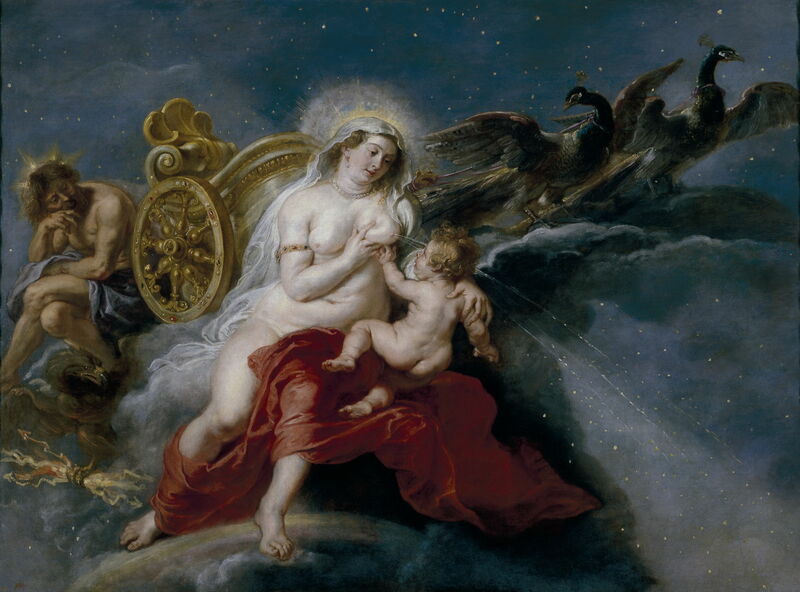 Shortly after the birth of Hercules, Mercury took the infant to Juno, who put him to her breast. When she realised who the baby was, she pulled him off the breast, and the excess milk which was released as a result sprayed over the heavens, forming the Milky Way. There are two outstanding paintings which show this unusual scene. Jacopo Tintoretto (c 1518–1594), The Origin of the Milky Way (c 1575), oil on canvas, 149.4 × 168 cm, The National Gallery (Bought, 1890), London. Image courtesy of and © The National Gallery, London. Tintoretto’s The Origin of the Milky Way (c 1575) shows the infant Hercules being pulled away by an anonymous assistant, with fine streams of milk gushing upwards to generate individual stars. In the background, Jupiter’s eagle appears to have a crablike object in its talons, perhaps representing the constellation of the Crab (Cancer), and Juno’s peacocks are at the right. Peter Paul Rubens (1577–1640), The Birth of the Milky Way (1636-37), oil on canvas, 181 × 244 cm, Museo Nacional del Prado, Madrid, Spain. Wikimedia Commons. Just a few years before his death, Rubens painted an even more wonderful version, The Birth of the Milky Way (1636-37). Jupiter sits in the background on the left, seemingly bored. Juno’s milk arcs out from her left breast over the heavens, and her peacocks look distressed. Other myths hold that Juno was still furious that Hercules had been born, so she placed two serpents in his cradle, in an attempt to kill the child. Hercules’ mortal twin Iphicles (not mentioned by Ovid) screamed at the snakes, bringing their father Amphitryon running. He found Hercules strangling the serpents with his bare hands: proof that he was indeed the son of Jupiter. 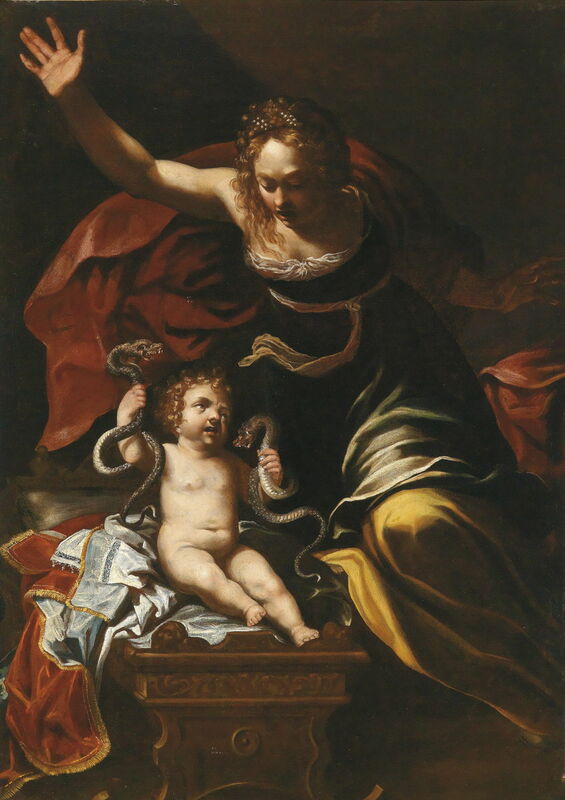 Several fine paintings seize this unique opportunity to show an infant strangling serpents. Bernardino Mei (1612–1676) (attr), Scene from the Infancy of Hercules (date not known), oil on canvas, 135 x 96 cm, location not known. Wikimedia Commons. This painting from the mid seventeenth century, attributed to Bernardino Mei, has been neutrally titled Scene from the Infancy of Hercules. Rather than let his father discover the baby’s strange abilities, it is Alcmena herself who has come running into the nursery. Pompeo Batoni (1708–1787), The Infant Hercules Strangling Serpents in his Cradle (1743), oil on canvas, dimensions not known, Palazzo Pitti, Florence. Wikimedia Commons. Pompeo Batoni’s account, The Infant Hercules Strangling Serpents in his Cradle from 1743, succeeds because it shows vividly Hercules’ parents, disturbed from their bed, discovering their baby despatching the snakes, all by the light of an oil lamp. The third version of this story comes from Sir Joshua Reynolds, who was commissioned by Catherine the Great of Russia in 1785, to paint her a history subject of his choice. Reynolds thought that he could flatter the Empress of Russia, perhaps, and produced this preparatory study for the heart of his final work. The Infant Hercules was painted between about 1785-88, then exhibited at the Royal Academy before being sent to Russia. 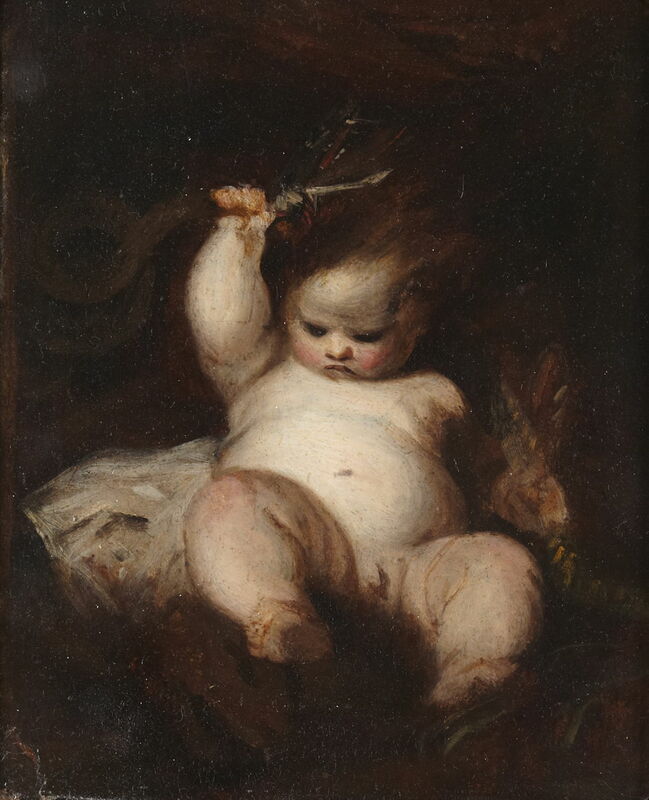 Reynolds is reputed to have used a real baby as his model, and later used this study for a painting of Puck as a baby. Joshua Reynolds (1723–1792), The Infant Hercules Strangling Serpents in his Cradle (1788), oil on canvas, 307 × 297 cm, Hermitage Museum Государственный Эрмитаж, Saint Petersburg, Russia. Wikimedia Commons. I think that Reynolds’ finished painting of The Infant Hercules Strangling Serpents in his Cradle (1788) loses the fine depiction of the baby in its elaborate supporting cast. It has also suffered problems with deterioration (probably saponification) in its paint layer, a common issue with Reynold’s old paintings. 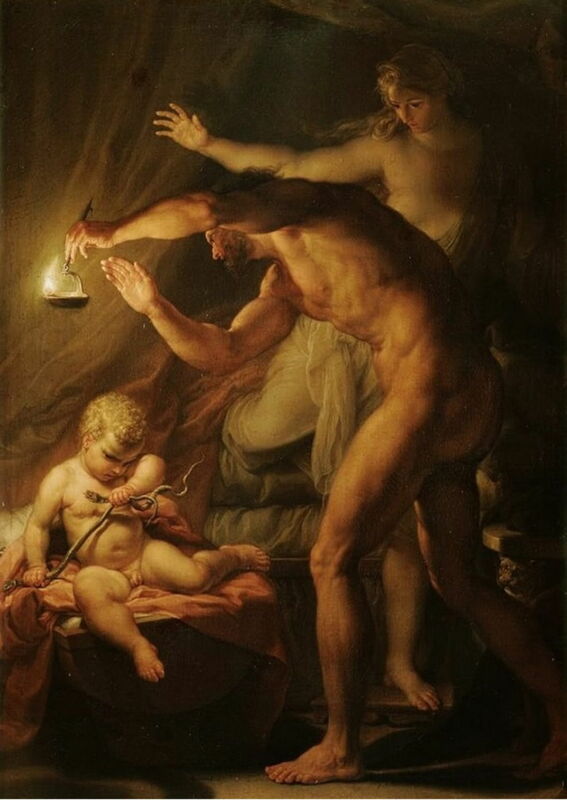 There is thus an ideal opportunity for someone to paint this story from Ovid, which might go alongside Rubens’ magnificent The Birth of the Milky Way and Batoni’s The Infant Hercules Strangling Serpents in his Cradle as a pictorial account of the infancy of Hercules. Posted in General, Language, Life, Painting and tagged Batoni, Hercules, Mei, Metamorphoses, myth, narrative, Ovid, painting, Reynolds, Rubens, Tintoretto. Bookmark the permalink.